All created in 3D Studio Max 4.2 (meshtools), manually unwrapped. For animation, I use Character Studio 2. Q3PPM (modeled, animated, skinned) based on the Quake 2 guard. 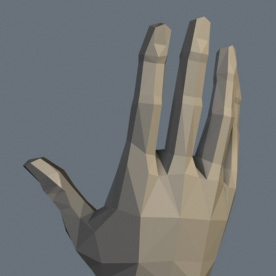 A generic hand model for the Gen. mod. Rigged and animated, this is my first venture in realistic anatomy-modelling and animating. The Keen 6 GoPlat for sliders. If you recognize this, you're among the few of Nostalgics Anonymous. Q3PPM (modeled, animated, skinned) based on the Quake Enforcer enemy. Nailgun for the W:ETF mod. Design based on the old version of the weapon. Slipgate boomsticks for Generations Arena. Slipgate axe for Generations Arena. Strogg grenade for Generations Arena. Doom armors for Generations Arena. Earth armors for Generations Arena. Strogg armors for Generations Arena. A whole bunch of Slipgate items for Generations Arena. A whole bunch of Strogg items for Generations Arena. A whole bunch of Earth items for Generations Arena. A whole bunch of Doom items for Generations Arena. Skins (and unwraps when indicated) I've made for models by other artists. All painted in Photoshop 5.5, using a Wacom tablet (first edition). Mostly for Generations Arena use. Slipgate class - Knight skin. Getting tired of the old Ranger model? Don't think Keel fits in with the Slipgater class? Well - here's the answer - a Deathknightish skin for Keel. Strogg class - slave skin. A tortured and converted Strogg trooper, now in a zombie like state. If you believe in that sort of thing. My personal skin, featureing my favourite colour-combination: camo-blue & orange hues. Generations Arena, Slipgate class Grenade launcher skin. Generations Arena, Slipgate class nailgun skin. Generations Arena, Earth class napalm-thrower skin. Generations Arena, Earth class mortar skin. Generations Arena, Strogg class BFG skin. Generations Arena, Strogg class RL skin. Generations Arena, Strogg class GL skin. Generations Arena, Strogg class SG skin. Generations Arena, Strogg class blaster skin. Generations Arena, Strogg class hyperblaster skin.